Happy holidays - no meeting in January. The Board normally meets at 7:30 pm, on the 2nd to last Tuesday of the month, Members and guests welcome at 8pm. Call for location and to join or volunteer: 514-272-5064. Joyeuses fêtes - pas de réunion en janvier. Rencontre du CA l normallement l'avant-dernier mardi, tous les mois à 19h30; membres et visiteurs à 20h. Appelez pour l'adresse, et pour vous abonner ou rejoindre l'équipe, au (514) 272-5064. 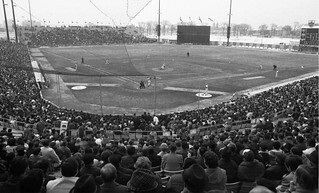 Did you know that the Montreal Expos played eight seasons at Jarry Park Stadium before the team moved to the Olympic Stadium in 1976? And that today parts of the the original stadium have been incorporated into the IGA Stadium where the Rogers Cup is held every summer? Did you know that on St-Jean Baptiste Day in 1965, Jarry Park hosted a wildly popular concert with 40,000 grooving spectators featuring Quebecois pop stars like Pauline Julie, Clémence Desrocher and Les Cailloux? And 19 years later in 1984 did you know that Pope Jean-Paul II held a mass in the same park attracting 300,000? 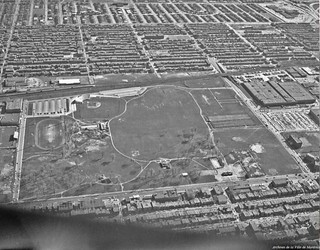 And finally, did you know that in 1927 Jarry Park was created by Dr. Arthur Jarry and his brother Raoul, a city councillor by leasing 35 acres of farmland and installing playgrounds, baseball diamonds and skating rinks so that the impoverished children of Villeray could get some fresh air and exercise? Today the park has grown to 89 acres with several tennis courts, baseball diamonds and two outdoor swimming pools; where soccer and cricket are played and more recently, a pond fostering birdlife in summer and skating in winter. 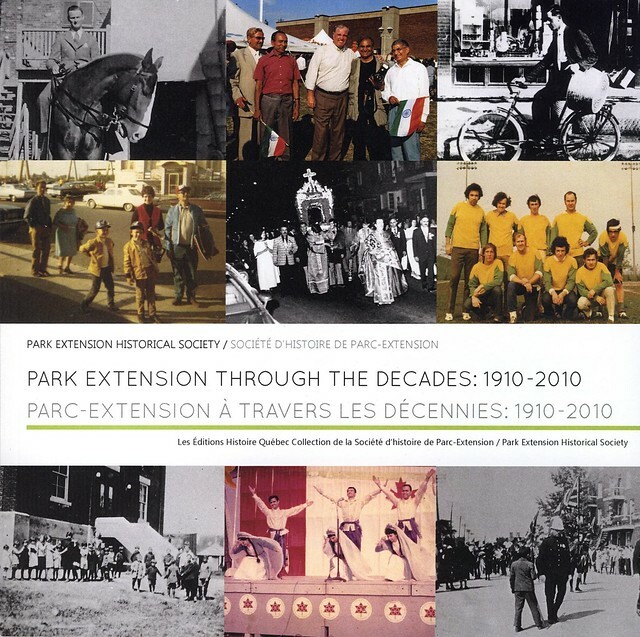 There is so much more..... come take a walk and learn more about Jarry Park's social, cultural and religious events; leisure, recreational and sports activities; and its natural history- the pond, birds and trees. I will have historical maps and photos for you to see. 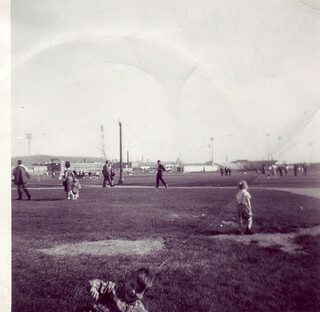 If you have any Jarry Park memories, memorabilia or photos to share, please do! The park is very flat. We will be walking on paved paths and on grass/dirt paths. There will be plenty of opportunities to sit and rest. Looking forward to seeing you Friday May 3rd! The “shoebox” house is a reminder of early suburbs of the city when small lots were available to build small, one-story houses, maybe with a vegetable garden alongside. Our borough, Villeray-St. Michel-Parc-Extension has recognized the architectural and social heritage of those fast-disappearing “shoeboxes” in today’s densifying housing landscape and enacted legislation to make it more difficult to demolish them, restrain redevelopment and encourage respectful renovation, maintenance and conservation by home-owners. A heritage architect was hired to make a report last summer. Our Historical Society was happy to collaborate in finding some 83 examples along our streets and we are eager to help other citizens discover them and appreciate their special features, using the Report’s classification based on construction dates and common architectural features dating from the “golden age” of brick masonry. Bring a camera. This is a good subject for our 2019 Jane’s Walk! 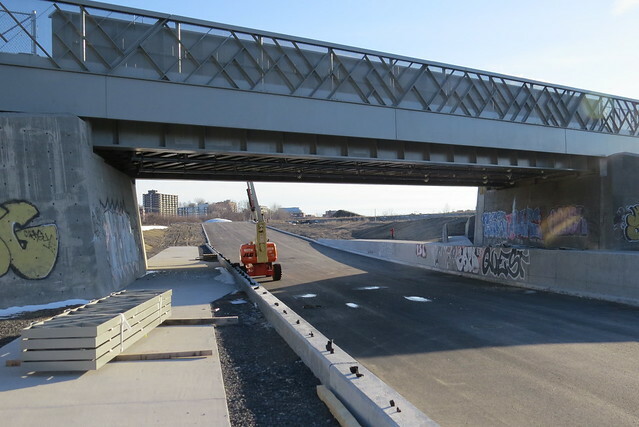 Most boroughs in the central and east of Montreal have examples of a such construction, particularly Rosemont and Hochelaga-Maisonneuve. Some sites in Villeray have been prettily renovated while those in Park Extension tend to be plainer. Owners and would-be owners are becoming more aware of their special character. We will visit a cross section of residential streets, starting at Beaumont Avenue and Acadie Blvd. 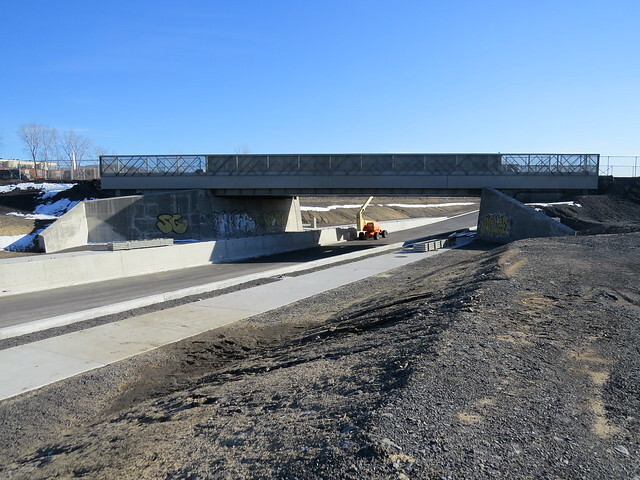 at the south west corner of Park Ex, and walk north east along 4 long blocks to the Jarry Street West underpass from where the 193 bus to Jarry metro and 80 to Parc metro and the 179 may be picked up. Small restaurants are not lacking. 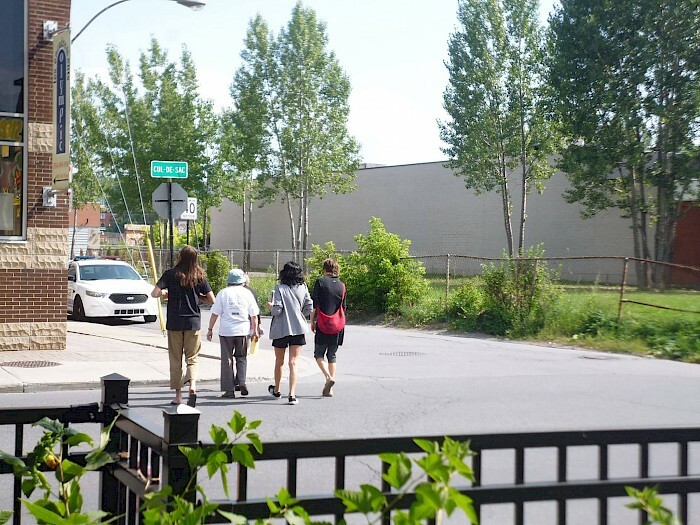 We explored the south end of Park Extension, where there are many fences, by walking along Beaumont Avenue from west (TMR) to east (a short section of Jeanne-Mance), turning north to the Parc Metro (1931 railway station of highest architectural heritage rating). 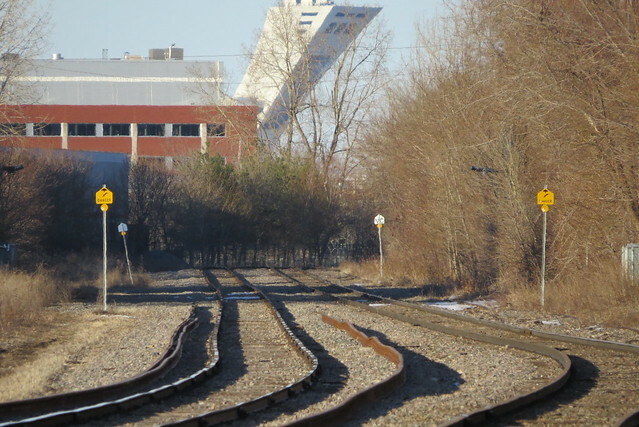 Landmark fences illustrate urban transformation from agriculture, through 20th century industrialization served by CP rail lines, to regeneration of the vacated Outremont train yard into a science and research “pole" by the Université de Montréal with extensive government funding. Mary, Grace, and Sasha were guides. In the spirit of Jane’s Walk we wonder what all this means to us and to the residents of the four surrounding boroughs today, and how we, as citizens, may influence positive change. 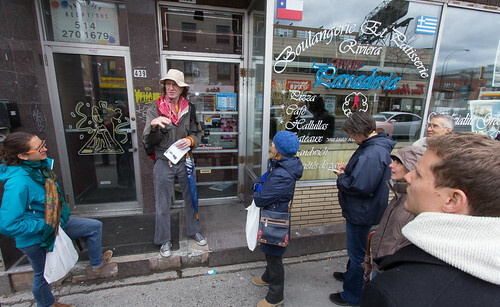 The Park Extension Historical Society also gave guided tours over this route last summer for the 375Mtl celebrations. We found that the chunk between the Acadie and Park metros has variety and contrast, where a few historical vestiges are still to be seen and imagined. 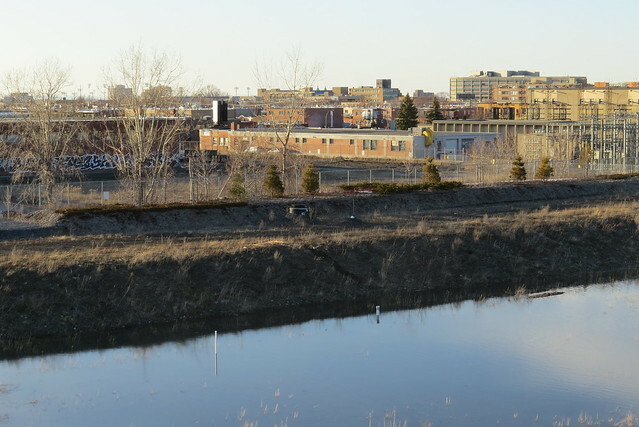 Time was devoted to the infamous Fence separating Montreal and Ville Mont-Royal and the 2019 footbridge entrance into Campus MIL, followed by forgotten factories. Seen as well: electrical and former gas substations, two specialty bakeries, an early municipal low-rental project with references to Social Housing today, an industrial building of municipal Heritage Interest, examples of re-used textile buildings, a well-equipped playground and a future park, and the site of the first triplexes where Park Avenue and Beaumont Avenue meet. As a historical society PEHS collects information about life and commercial activity in former days. Therefore we invited Walkers who may have had stories about family or work experience in Park Extension. As construction takes place to redo the siding and renovate the interior of the building located at 821 Ogilvy, it seems like a good time to share some of the building's history. It was originally built by the congregation of St. Cuthbert's Anglican Church, and later served as a Gospel Hall and Greek community centre. Many thanks to Rev Roslyn Macgregor of St. CHL for sharing these precious photos and historical texts related to St. Cuthbert's early years. by Josephine A. Dicks, 1931. From the centennial program published in 2010. 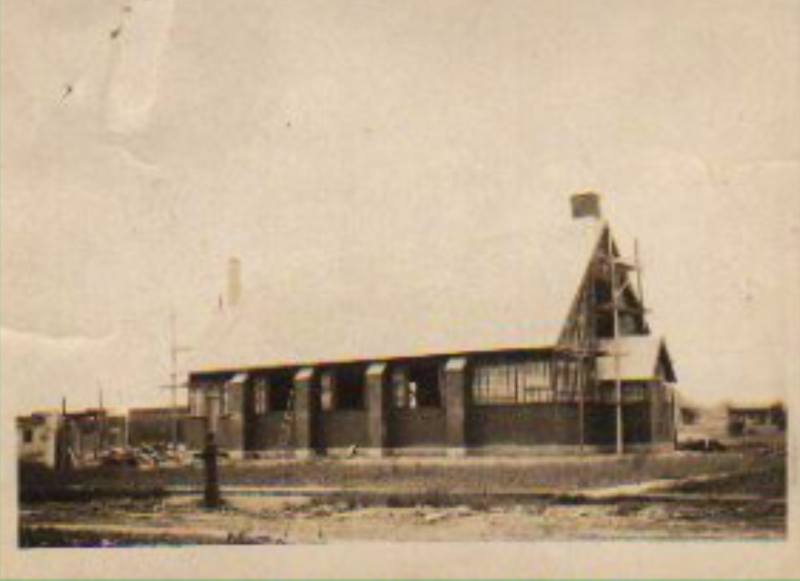 There were not more than fifteen families in Park Avenue Extension when a temporary portable church building was erected on May 1, 1910 on King Edward Boulevard (now Querbes Avenue) near Beaumont Street. The opening collection was $13.93, and the collection for the following Sunday was $1.27 – this was the average collection in the early days of St. Cuthbert‟s. A Concert in the same year (1910) brought in $34.70. At the end of the year there was a balance in hand of $60.52. At the opening of the Church, the Bishop promised to contribute dollar for dollar towards the building of a more permanent church, to the extent of $2,000. At the second vestry meeting a Building Committee was formed, for the purpose of raising funds for a new Church on the site, consisting of five lots which the Bishop had bought on Ogilvy Avenue, corner of O'Shaugnessy (now Outremont Avenue). The new Church was started in May 1913, and completed by September 10th of the same year, but owing to the absence of the Bishop, the opening and dedication was delayed until September 24th, 1913. The stained glass window in the chancel was a gift from the children of the Sunday School. The money for the Baptismal Font was collected by the late Adeline Dicks. Also a number of things were obtained from the Church of the Ascension and some members of the congregation to help furnish the new Church. In these days, the Church was maintained with very little expense, everyone giving freely of their time, and helping according to their ability. Miss Mabel Platt was organist. Everyone belonged to everything, and co-operated in giving the concerts, Christmas trees, picnics, etc. The concerts were always well patronized. The Church, of which the congregation was justly proud, stood in the middle of the fields, as if waiting for the houses to be built all around. One paused to wonder if it would ever be filled with regular members of the congregation. At the Opening Service of the Church, Wednesday, September 24, 1913, the Church was filled to its capacity. (Collection $29.18). The first wedding was on June 27, 1914, when Miss Elizabeth Brown was married to William Wilson by the Rev. F. C. Ireland, who presented the newly married couple with a Bible. On Wednesday, September 30, 1913 a meeting of the Women for the purpose of forming a Women‟s Guild was held. In 1914 Mr. Powles organized the Sunday School, and during his ministry the Sunday School teachers won the Bursary for attending the classes at the Synod Hall, an achievement of which the parish was proud. Mr. Powles also organized a Dramatic Society, which ran successfully for a number of years. In 1915, the wardens decided to ask the Bishop for a resident incumbent, and so in June of 1915, the Rev. W. J. Farr was appointed the first resident minister. At the first meeting to greet the newly appointed clergyman, only two ladies were present at the weekly meeting of the Guild. The Rev. Farr was followed by The Rev. Baugh, the Rev. Wright and the Rev. Laws. 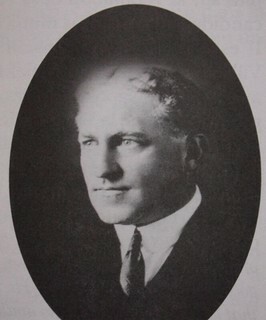 In 1925, the Rev. A.G. Howard succeeded the Rev. Laws as Incumbent. In the same year, the church was enlarged to its present size, and other improvements added. Six years later, on February, 1931, the parish ceased to be a “Mission” and now became self-supporting. Another indication notable historical record is that of the streetcar service. Up to 1916, residents of the district had to walk to Van Horne to obtain a streetcar. Going eastward toward St. Lawrence Boulevard they had to climb the fence and trespass on railway property, or else go south as far a Beaubien Street to cross the railway. In 1916 the streetcar service was extended as far north as Atlantic Avenue, that is, to the C.P.R. tracks. 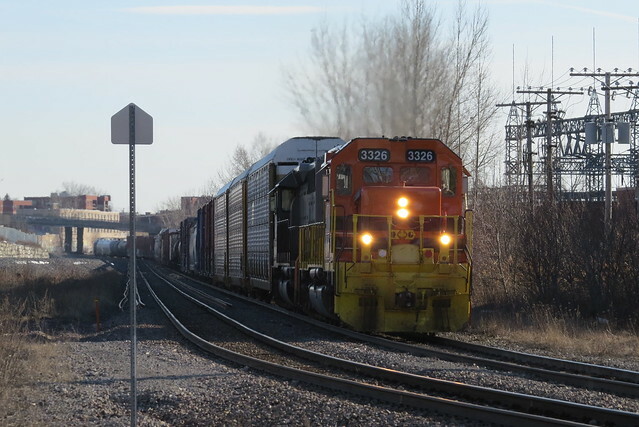 It was the Amherst car which first came up to the tracks. A few years later this was changed to the Bleury service. 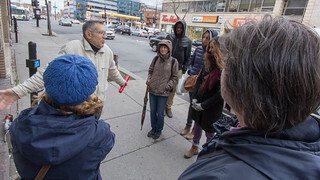 In 1920, a stub-line service was inaugurated from Beaubien to Blair Avenue; and many are the residents who remember the community gatherings every evening in Parnell‟s corner store as they crossed the tracks and waited there for the “Toonerville” to come along. This was still an area of wooden sidewalks and macadam roads. And many were the sad tales in spring and fall of daintily dressed dames who stepped on the loose plank and ruined a brand new Easter outfit. Many also were the planks that disappeared from the sidewalk in early fall, when nights were growing chilly and coal was still a costly luxury. A few years later came the cement block sidewalks that many of the streets still have. Then the pavements in asphalt, the subways, the new railway station, and we are into the realm of recent history, which most even the newcomers remember. Dès la fin du XVIIIe siècle, les premiers services religieux anglicans au Canada se déroulent dans des églises catholiques. Anglicans et catholiques se partagent alors l’occupation du lieu de culte en fonction d’un horaire alternatif établi selon la division linguistique de la colonie. Ce n’est qu’au milieu du XIXe siècle qu’on voit apparaître les premières églises spécifiquement construites pour le culte anglican. Fondée en 1910, la mission St. Cuthbert’s fait ériger en 1913 une église en bois qu’elle occupe jusqu’en 1948 pour les besoins du culte. Cette communauté existe jusqu’en 1989 (aujourd’hui elle est fusionnée avec la communauté St. Cuthbert, St. Hilda, St. Luke). L'église est agrandie en 1925 selon les plans de l’architecte Philip J. Turner*. Cette église est caractéristique des églises anglicanes. Elle est la plus ancienne église construite dans ce secteur en plus d’être la première église attribuée à cet architecte. Comme la plupart des édifices religieux conçus durant la première partie du XXe siècle à Montréal, cette église est d’esprit néo-gothique. Elle conserve toujours la majorité de ses caractéristiques d’origine. Elle possède une haute toiture à versants, ses ouvertures sont surmontées d’un arc en ogive et des contreforts décoratifs utilisés sur les murs latéraux. Tous ces éléments ont été conservés. La modification de l’usage au début des années 1980 a nécessité des rénovations mineures qui demeurent peu perceptibles de l’extérieur. Ce bâtiment est mis en valeur par l’aménagement du parc Outremont / Ogilvy qui offre une perspective intéressante sur l’édifice. De plus, il est l’un des premiers bâtiments construits le long de l’avenue Ogilvy. Il est donc un témoin précieux du fondement même de cette avenue. Rénovation extérieure et réaménagement intérieur. Réfection du parement et aménagements intérieur. 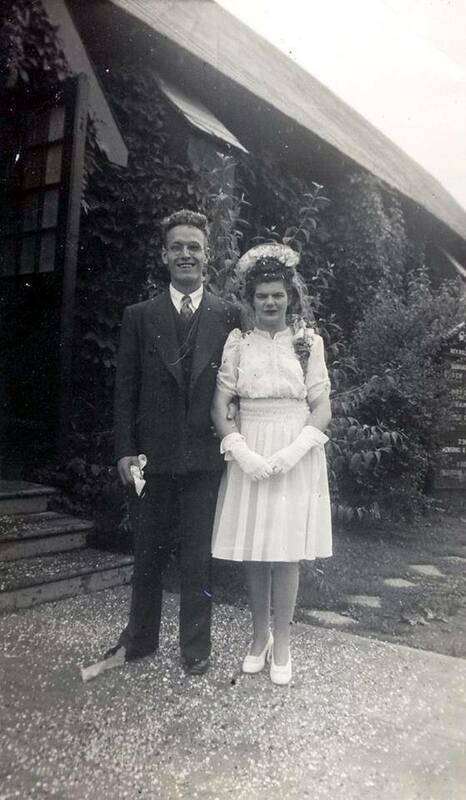 Wedding couple Christopher and Grace Bridgman at 821 Ogilvy (photo courtesy of Ron Bridgman) on July 12, 1943. The Rev. and Mrs Farr, of St. Cuthbert's Anglican Church. 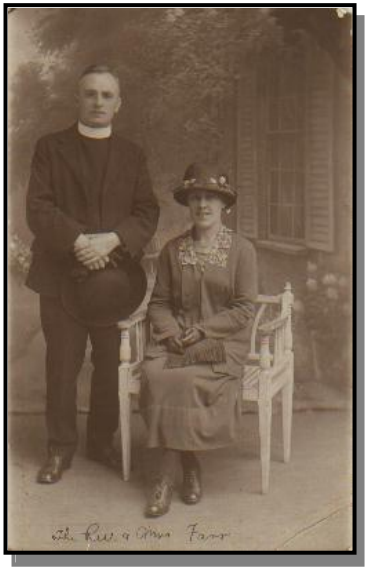 The Reverend W. J. Farr was appointed as St. Cuthbert's first resident minister in June, 1915. "The parish is situated in a residential district in the north of the city. 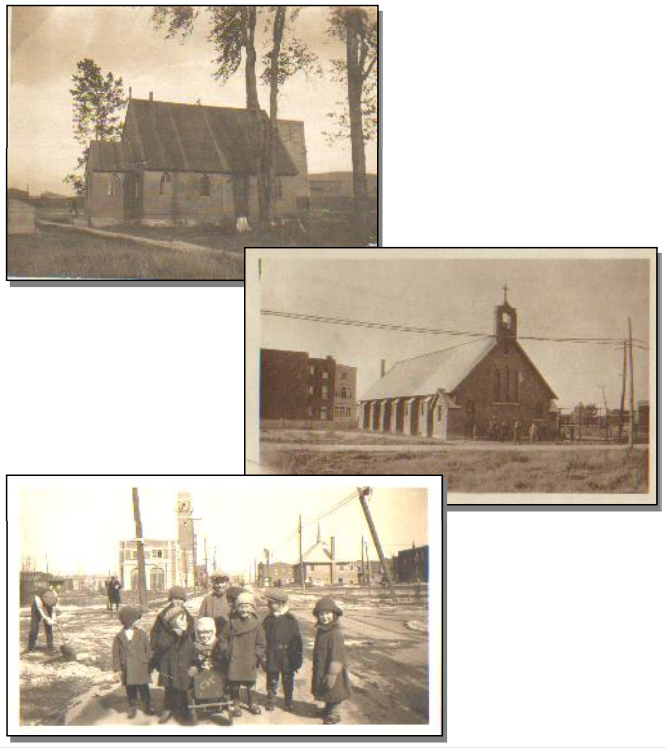 The first church, a wooden building, was opened by Bishop Farthing, May 1st, 1910. the second, dedicated three years later on September 24th, 1913, was further enlarged in 1925. Purchase of a site for a permanent church, comprising seven lots, was made in 1931. The "coming of age‟ of the parish in 1931 was observed by the parish becoming self-supporting. Next year, 1935, will be observed as "Silver Jubilee Year.‟ Other important dates in the history of St. Cuthbert‟s: June, 1912, Rev. F.C. Ireland, B.A., appointed Bishop‟s Missionary; June, 1914, Rev. P.S.C. Powles, appointed incumbent; June, 1915, Rev. W.J. Farr, appointed incumbent; May, 1918, Rev. J. Irving appointed incumbent; May, 1919, Rev. C.W.P. Baugh, appointed incumbent; June 1920, Rev.G. Wright, appointed incumbent; January, 1922, Rev. H.S. Laws, M.A., appointed incumbent; December 1923, mortgage on the Church paid off, extension to church completed; February 1st, 1931, Rev. A.G. Howard, appointed first rector." From the Bishop's Letter (Bishop John Farthing), dated February 2, 1938. "Doesn't the following quotation move you: The war in Germany may last until 1945. That is the official prediction. Yet at this crucial period production of articles by the women of this province for the Red Cross has declined so steeply that we doubt whether we can fill anticipated demands to help our soldiers, sailors and airmen, for victims of robot bombs and for the people of newly liberated countries in Europe. Why? This is why! Because we have not enough women working in Quebec for the Red Cross. You can correct this appalling situation at your nearest Red Cross Branch. St. Cuthbert‟s Group meets on Thursday at 2.30 p.m. at the Church. Let your conscience be your guide!" Note: In 1948 the congregation built a new church on St-Roch and Wiseman streets. 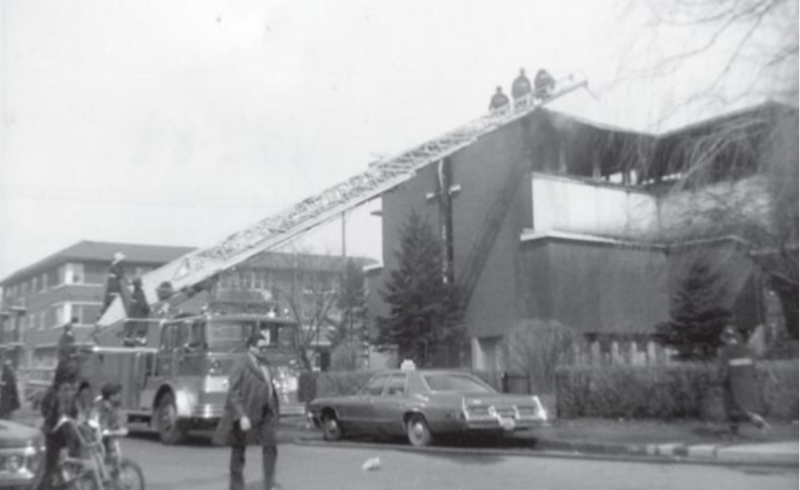 It burned in April, 1975. In 1992, St. Cuthbert‟s Church and the Church of the Ascension merged with St. Hilda's Church at 6341 de Lorimier. In 1995, St. Luke's Church on Holt Avenue in Rosemount was closed. The resulting church community became the Parish of St. Cuthbert, St. Hilda and St. Luke – or St. CHL as we are fondly known. 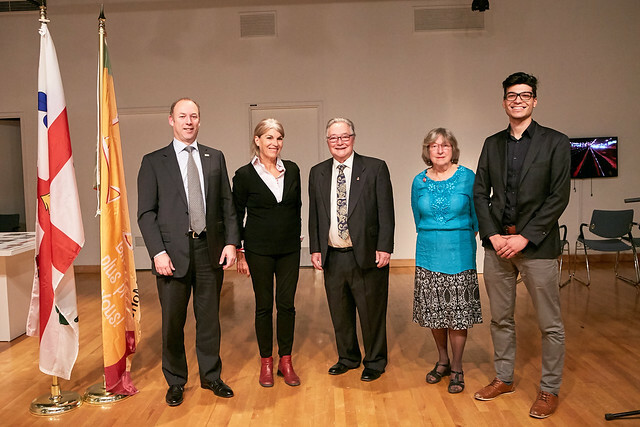 The board of directors meets in most months on the second-to-last Tuesday evening (see above). Le conseil se rencontre normalement au 2e avant-dernier mardi du mois (voir ci-haut). NEXT ANNUAL MEETING: The 8th Annual General Meeting of the members will be held in November, 2017. Members in good standing may stand for election to the board. Business reports for 2016-2017 will be presented, followed by a social hour. For more information call (514) 272-5064 or (514) 271-6650. PROCHAINE RÉUNION ANNUELLE : La 8e assemblée générale annuelle des membres aura lieu au mois de novembre. Les membres peuvent se présenter pour un poste de direction. Les rapports pour 2016-2017 seront présentés, suivi d'un léger goûter. Pour de plus ample renseignement, veuillez téléphoner au (514) 272-5064 ou (514) 271-6650. 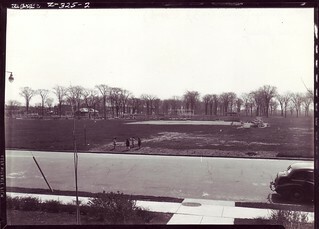 Au début des années 1920, les frères Raoul et Arthur Jarry ont eu l’idée de doter d’un parc la nouvelle zone d’urbanisation qu'est aujourd'hui l'arrondissement de Villeray. Selon Arthur, qui était médecin, les enfants et les familles avaient besoin de prendre du bon air et de faire des activités récréatives vu les précaires conditions de vie dans lesquelles les premiers habitants du quartier vivaient. 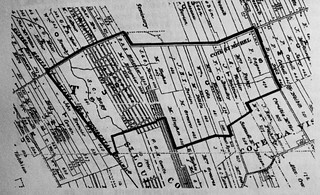 Raoul, conseiller municipal pour le district de Villeray dès 1921 et membre du comité exécutif de la ville dès 1924, recommandait à la ville l’acquisition du parc, ce qui fut accepté en 1925. Le nom du parc Jarry fut dès lors donné en honneur de Raoul, décédé en 1930. 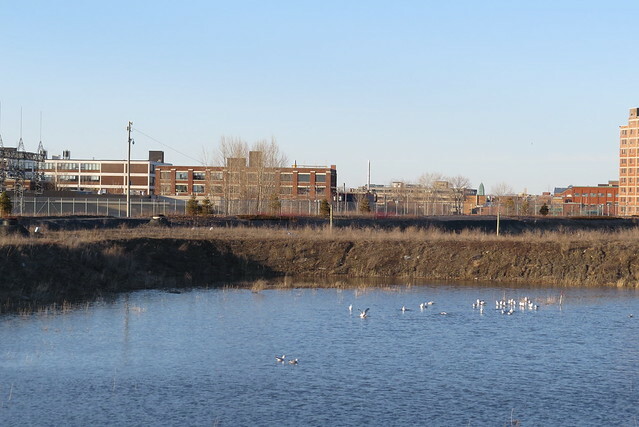 Le parc Jarry compte alors 35,6 hectares. Les terres ont été la propriété de la famille Jarry qui les a vendues à la Stanley Clark Bagg. 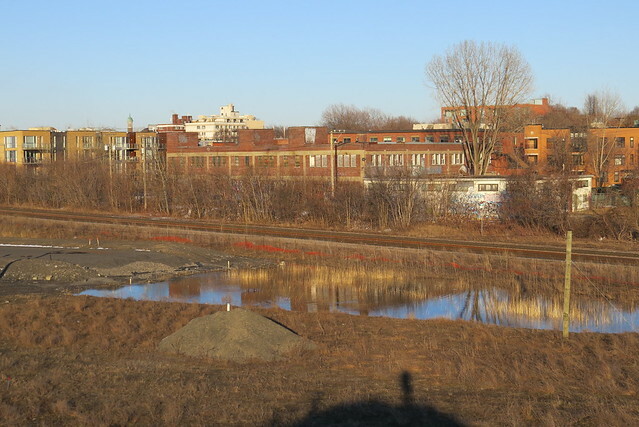 Sur le carte et la photo, on peut voir le ruisseau Saint- Aubin qui traversait le parc dans son axe sud-est pour se joindre à la rivière de la Montagne ou ruisseau Provost tout près du stationnement actuel d'Hydro-Québec. En 1925, la ville de Montréal louera le terrain à Robert Bagg, fils unique de Stanley Clark Bagg, pour y créer le parc Jarry. Finalement, en 1945, la Ville acquiert le terrain pour 480 418.50 $. Dans ses débuts, le terrain boisé d’ormes et d’érables était équipé de balançoires, de bacs à sable et de glissades. 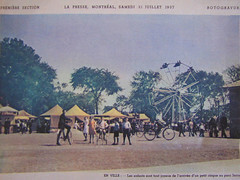 Le parc était animé par les concerts de la fanfare Campbell et à l’occasion le cirque faisait la joie des petits et des grands. À la hauteur de la rue Gounod, un chalet avec restaurant fut construit. Pour permettre aux enfants de traverser le boulevard Saint-Laurent en toute sécurité, un tunnel a été creusé au début des années 1950. 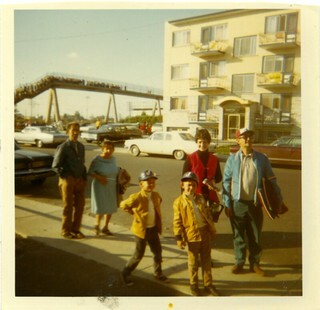 On aménagea également une passerelle pour les piétons, en 1966, liant Parc-Extension au parc Jarry. En 1960, la Ville construit un stade, des pistes d’athlétisme et une patinoire de glace artificielle. En 1995, le secteur sud-est est aménagé zone verte avec un étang, fleurs et arbustes, on organise aussi une zone récréative, des terrains de tennis et de soccer, une aire de jeux pour les enfants, un site de rouli-roulant et des sentiers. 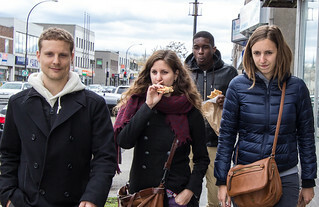 Plusieurs événements ont place au parc Jarry, entre autres des festivités de communautés culturelles, le théâtre La Roulotte, et des concerts. 15 avril 1964. 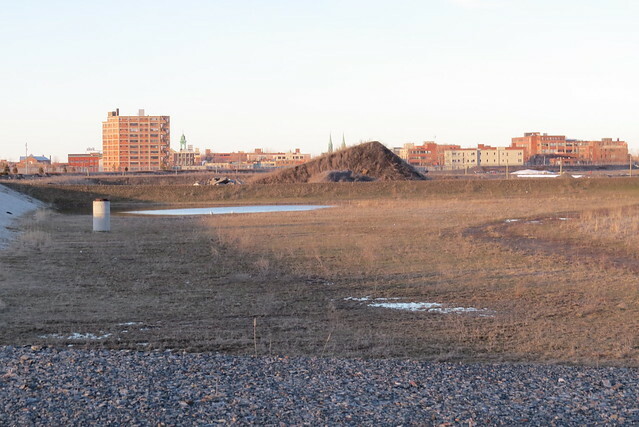 Au loin le futur stade des Expos, au loin à gauche le Mont-Royal. Depuis le début du parc, les sports sont pratiqués ; on voit plusieurs équipes jouant à lacrosse sur le terrain. En 1950, l’équipe de football Les Alouettes a utilisé le parc comme aire d’entraînement ainsi que l’équipe de soccer de Montréal en 1966. Un diamant de baseball a été construit en 1960 et l’arrivée des Expos en 1969 a donné une nouvelle vie au parc, qui a reçu plus de 7 500 000 spectateurs pendant les huit ans où ils ont joué au stade Jarry. Maintenant, il y a des équipes de soccer, de hockey et le tournoi international de tennis, Coupe Rogers. Aujourd’hui une vingtaine de sports se pratiquent au parc Jarry. Les avez-vous tous essayés ? Baseball, basketball de rue, bocce, cardio-musculation, cardio-poussette, cricket, hockey, hockey cosom, marche, natation, patins à roues alignées, pétanque, planche à roulettes, soccer, tennis, ultimate frisbee, slackline, vélo et volleyball de plage. Depuis 1954, les jeunes athlètes participent à des compétitions dans les parcs de la ville. 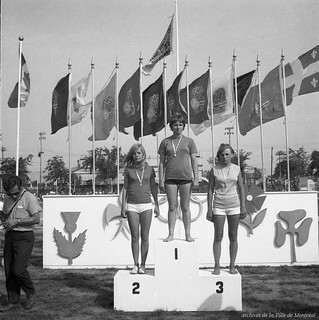 Appelées d’abord les Olympiades, elles changent de nom pour les Jeux de Montréal en 1978. En 1973, s’est tenu le congrès international des Témoins de Jéhovah où 70 000 repas ont été servis en quatre jours. Onze ans après, en 1984, le Pape Jean-Paul II a célébré une messe en plein air devant 300 000 personnes. 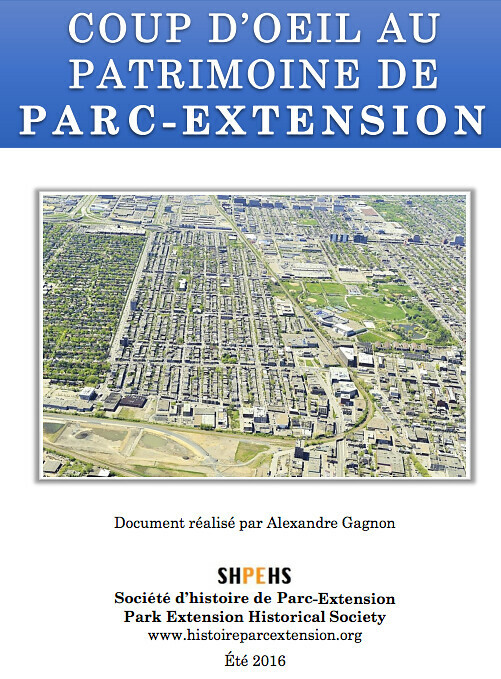 En 1985, le parc Jarry est rebaptisé parc Jean-Paul II, mais en 1988, on revient au nom original. En juin 2015 des célébrations ont eu lieu pour le 90e anniversaire du parc. 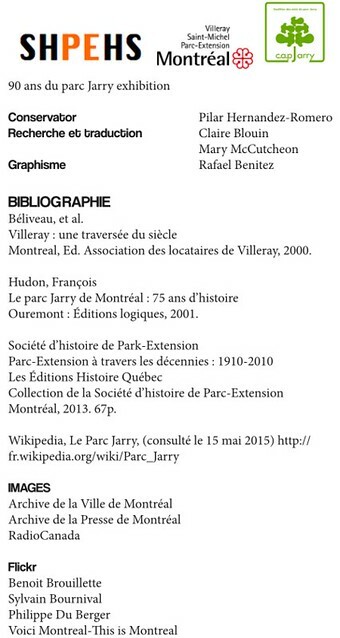 Organisé par la Coalition des amis du Parc Jarry, cette exposition sur l'histoire du parc a été montée par la Société d'histoire de Parc-Extension et fut exposée dans la bibliothèque de Parc-Extension au cours des mois de mai et juin en 2015. 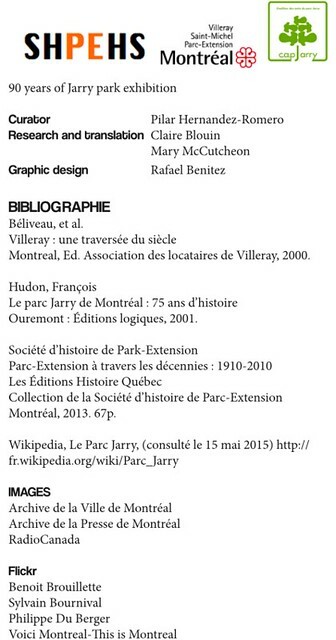 In the early 1920’s, two Jarry brothers, Raoul and Arthur, had the idea of giving a park to the new urban development known today as Villeray. Arthur, a doctor, felt that the children and families needed fresh air and recreational activity to counter the poor living conditions that greeted the newcomers. 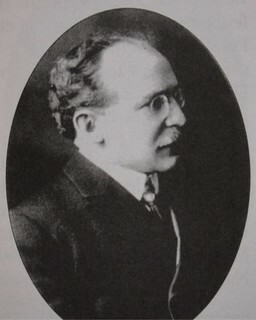 Raoul, a city councillor for Villeray since 1921 and a member of the City executive committee after 1924, took a petition to the city that was adopted in 1925. The park was named in honour of Raoul, who died in 1930. 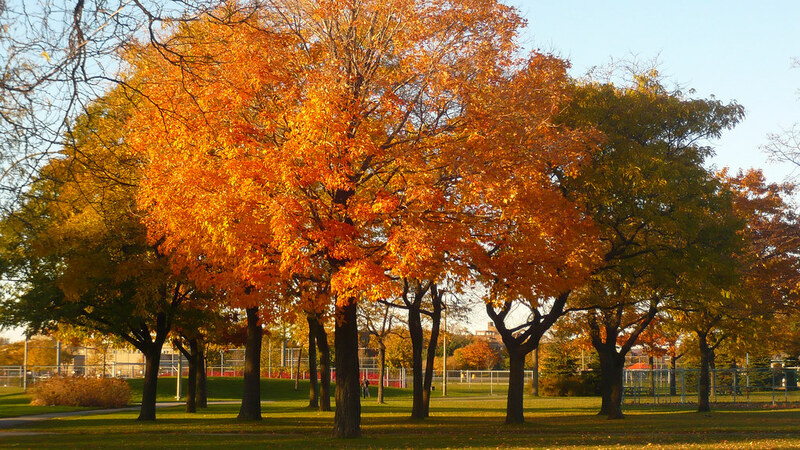 Jarry Park consists of 35.6 hectares that once belonged to the Jarry family, who then sold it to Stanley Clark Bagg. The map and photo show the Saint Aubin stream that flowed down from Mount Royal across the property. 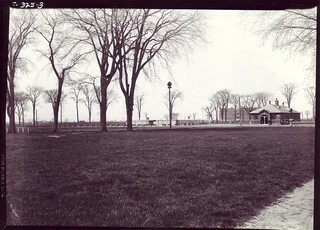 In 1925 the City rented the land from Robert Bagg, Stanley Clark’s only son, to make Jarry Park. Eventually, in 1945, the City bought the land for $480,418.50. In the beginning, the woods of elms and maples had swings, sand boxes and slides. Campbell band concerts and circuses entertained children and adults from time to time. Across from Gounod Street a chalet with a restaurant was built and a pedestrian tunnel was dug under St-Laurent Boulevard. 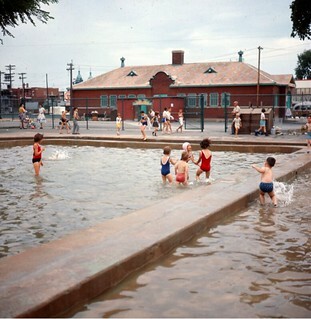 On the west side, in 1964 Park Extension was connected by a footbridge over the railway tracks. In 1960 the City of Montreal built a stadium, athletic tracks and an artificial ice rink. In 1995 a green oasis was created in the south-east sector of the park, with the installation of the pond and the planting of many flowers and shrubs. Fields for soccer and tennis were created, as well as the children's playground, the skate-park and numerous paths. 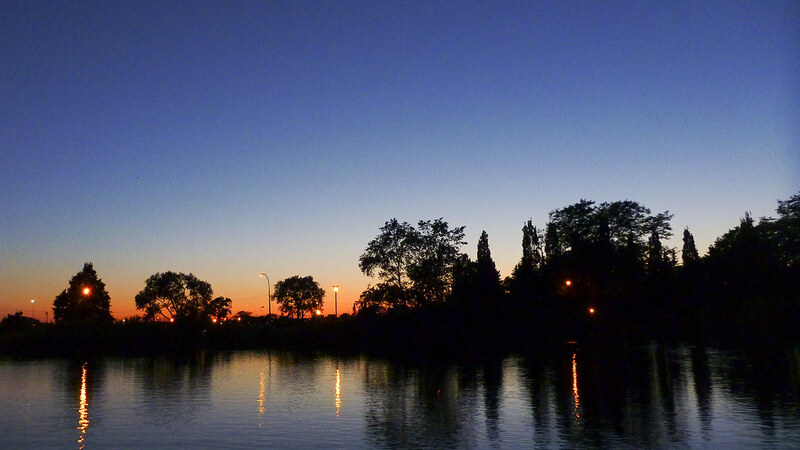 Many events take place in Jarry Park, such as outdoor theatre, community festivals and concerts. 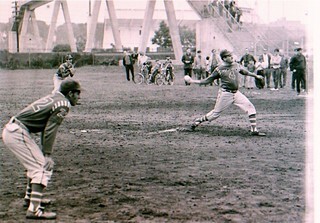 Since the Park began, many sports have been played there. At first, lacrosse teams dominated and in 1950 the Alouette football club trained there and in 1966, the Montréal Soccer club. Baseball arrived in the early 1960’s when a small baseball stadium was rehabilitated for the Montreal Expos in 1969. This became the most popular sport, rejuvenating the park and welcoming more than 7,500,000 spectators during the Expos’ 8 years there. Today soccer, ice hockey and tennis, with its Rogers Cup and large stadium dominate. 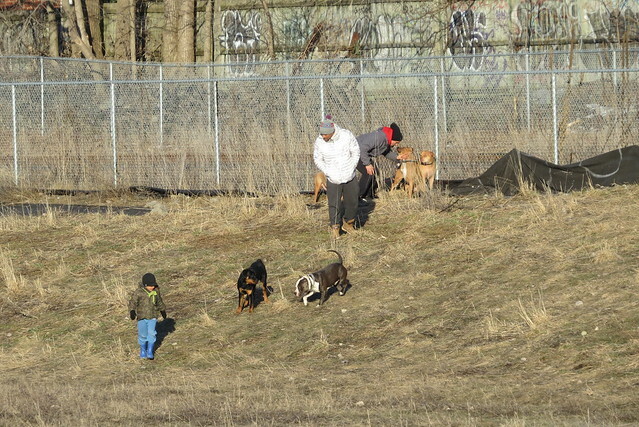 Baseball in the Park Extension "Piggery"
Today nearly 20 sports are played in Jarry Park. Have you tried them all? There is baseball, street basketball, Bocce, cardio-physio, cardio-stroller., cricket, hockey, street hockey, walking, swimming, in-line skating, lawn bowling, skateboarding, soccer, tennis, ultimate Frisbee, bicycling and beach volleyball. 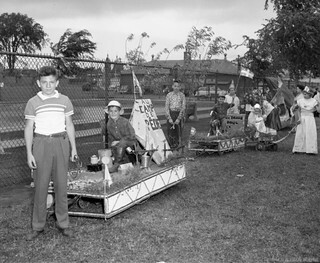 Since 1954, young athletes have competed in the city parks. First called «Les Olympiades», in 1978 the name changed to The Montreal Games. 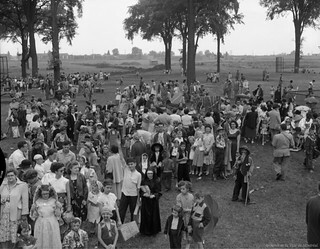 In 1973 the International assembly of Jehovah’s Witnesses took place in the Park and over four days, 70,000 meals were served. 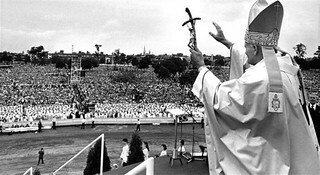 Eleven years later, in 1984, Pope Jean Paul said an open air mass for 300,000. 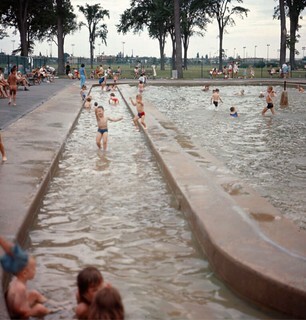 In 1985 Jarry Park was renamed Parc Jean Paul II but in 1988 it reverted to Jarry Park. 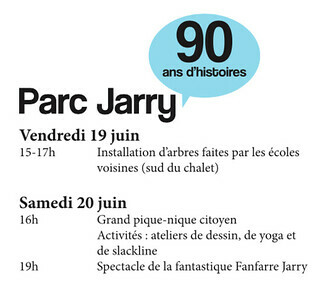 The Coalition des amis du Parc Jarry organized a celebration for the park's 90th birthday in June 2015. 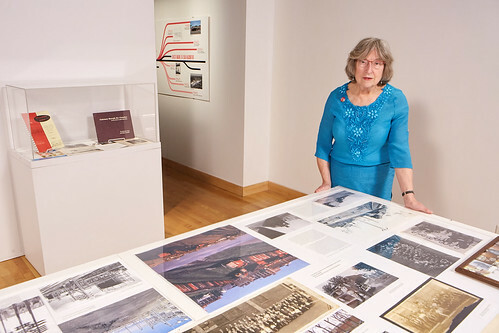 This exhibit on the history of the park was created in collaboration with the Park Extension Historical Society and shown in the Park Extension library in May and June of 2015. Update (August 22nd, 2016): Tom has a new album of Outremont campus photos, including those of the Jardins éphémères that currently occupy a portion of the land for the future campus. See the album here. A work in progress by Society member Spiro Couris Athina Maroudas, posted on his Facebook page on March 31, 2013 and shared here with his permission. Angelo Bacoyiannis takes part in the Greek Independence Day parade in Montreal, March 24, 2013. Although Greeks had a presence in Montreal for many decades, in fact from the end of the 19th century, there was a great influx of new immigrants starting from the major earthquake that hit the Ionian Islands in 1953. 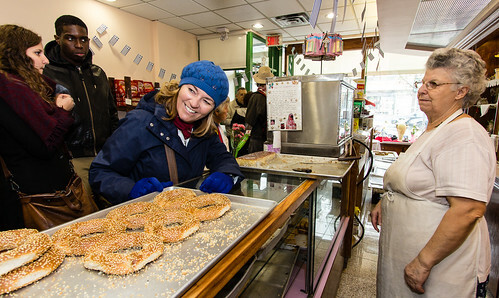 These displaced Greeks started a mass exodus from Greece and many ended up in Canada. Economic trouble led many others to also leave and coupled with a more lax immigration policy a great chunk of the Greek population left Greece in the 1960s. The number of Greeks in Montreal increased from 3,000 to 15 times that in 1967. They started their own associations their own restaurants, nightclubs and even multiplied their number of Greek cinemas. 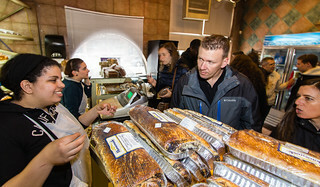 Soon there was a new culture of Greeks who were not trying to assimilate into Montreal Canadian society but rather they preferred to live in a ghetto-like environment which could be called Little Greece. Their children were their connection to Canadian society since most youth were becoming Canadians but a Greek no longer needed to learn a foreign language. They were able to work, shop and play in a Greek environment and very rarely needed English or French unless they had to deal with government business. Even going to see a doctor it was only necessary to speak English if going to Emergency since there were many Greek family doctors available. When the need arose their children were ad hoc interpreters. Picture a 10 year-old translating for his mother at the gynecologist (not in the examination room but in the office afterwards)...I had to deal with that sad fact. It was an easy task for the first Greeks to assimilate since their number was manageable and since they arrived in small groups the local Greeks were able to cater to each new member’s needs. This was not the case however for the masses that started arriving post war. Local organizations were not equipped to handle the inordinate number of new immigrants. The Cretan Association for example had a couple of rooms above their club house where new arrivals could get a place to sleep and food to eat while they established themselves in the new environment. When boat loads of Greeks arrived in Halifax in the 60s and were then transported to Montreal by rail, they came with their whole families and if they had no relatives to stay with, it was hard to find shelter for them and many ended up shacking up with other families in small 1 or 2 bedroom apartments. 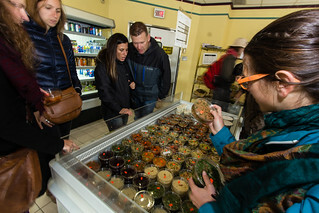 The attitude of the new Greek immigrants was live in Canada for five years then go back to Greece with money and reestablish their lives in the old country. Unfortunately, the vast majority was only able to make enough to get by and at the same time their children were mixing well with their new surroundings so were not eager to leave. Outside factors also played a part in this change of plan. First conditions were not improving in Greece as severe drought was impeding the return to farming and in 1967 the political situation came to a head with the coup of the Colonels and with them curtailing rights of the citizen in Greece. This prompted many families to stay in their new Canadian home. A new problem was created. Since both parents had to work and so have no time for their children, the new immigrants needed help in raising them. The two options at this point were to either bring the grandparents from Greece to raise the children or to send the young ones back to Greece to be raised by their grandparents. A good number of my friends have stories of meeting their parents for the first time at the age of 11 or 12 after having been shipped back to the village at 1 or 2 years old. Conversely some have stories of their grandparents mistreating them while their parents were away working long hours since the grandparents had very few child rearing skills and tried to raise their children’s children in the old ways. 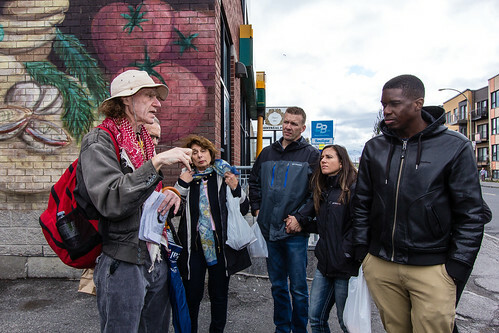 The mass of immigrants changed the landscape in Montreal. 50,000 people needed services, needed access to entertainment and even to schools to teach Greek traditions for their children. Entrepreneurs were quick to provide. And so we got four Greek movie theaters, half a dozen night clubs with live music, restaurants serving purely Greek cuisine and a myriad of cafenia (coffee houses). The new immigrant was yearning for food products from Greece and the one or two corner grocers that carried Greek products around at the time were not sufficient to meet demand. As a result we got new Greek oriented supermarkets. Four Brothers, Sakaris, and PA to name a few changed their look to accommodate the increased clientele and moved to larger spaces. The Greeks were feeling at home. They also missed the company of their compatriots from the village and so formed non-profit associations to be with one another. In fact one group from the Pelloponese area around Sparti, Laconia province, had over 40 different associations; one for each of the villages around Sparti. Skaliotes, SkouroVarvitsiotes, Krokeates etc. all congregated at specified meeting places and many even opened their own club houses (lesches). Each could boast at least 100 active members. At these clubs they met for coffee, and talked about the village, about which new arrival from the village needed a job, and how to raise money to build a new clinic or a new belfry for the church in the village. They wanted their children to be ready for the return home so teaching them the village dances the village traditions and foods was primordial in their thoughts. They raised money by holding annual dances and small gatherings similar to spaghetti dinners over the course of the year (synaistiasis). Now this is where things get interesting. Around the same time as Greeks were arriving in Montreal the Canadian government was introducing social programs geared to the poorest in society: Social Welfare, Unemployment Insurance and Public Health Care. Since there were so many immigrants in factory and unskilled service jobs such as cleaners, waiters, dishwashers, it was soon realized that exploitation of workers was likely an issue. With this in mind and with the noblest of causes (defense of the poor) an association called The Association of Workers and Employees. (syllogos Ergatoypallilwn) was formed. Their aim was to help Greek workers get around the language barrier, fill out applications for new employment, guide them around labour laws, and help them with the bureaucracy of dealing with Unemployment Insurance. Since this attracted a left wing element they soon came to loggerheads with the Hellenic Community. They viewed the administration of the Community at the time as a barrier to self realization of Greek immigrants since most would never become self employed nor successful in their eyes. It is a fact that many workers were employed by past immigrants who had become successful in Canada. And these same immigrants were administering the Hellenic Community. In the eyes of some in the Workers Association these people that were running things at the Community were also the ones that were exploiting their workers. The left wing view was also preaching that “religion is the Opiate of the People”. This made them a natural enemy of the Greek Orthodox Church around which the Hellenic Community was based. It didn’t take long for the Greek immigrants to start choosing sides. At this point I feel the need to post a disclaimer. All comments are from verified facts and experiences. I do not attempt to take sides on the matter but rather to record events that changed the life of Greeks living in Montreal. In fact it was this dichotomy which resulted in the high level of organization and political involvement of the local Greeks which as a side effect created the Government subsidized Greek Day Schools and other Quebec-recognized Greek organizations such as the Hellenic Congress of Quebec and Canada. Yes The Hellenic Canadian Congress began right here in Montreal. My family are all located in Greece and my parents were the first to venture outside its borders. I got to Montreal as a 7 year old from Greece. My father having an aversion to living in homes others had lived in found a multiplex which was just built near St. Michel and Rosemont. So even though I was not allowed to go to a French Catholic school (the laws were strict then not catholic no French school) I managed to learn my French on the streets. Having only 4 channels on TV I needed variety so started watching Channel 2 and Channel 10. These were the shows I learned my French with.